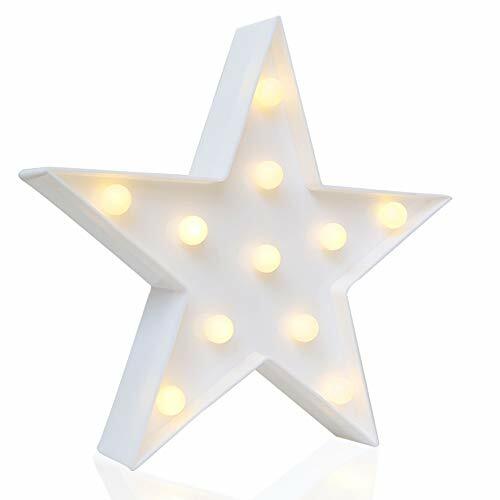 Inspired by old school marquee signs commomly seen in front of theaters, this star marquee lamp is extremely adorable. It will undoublty catch the eyes of anyone who walks by! The LED lights emit barely any heat during operation. Thus, it's safe to leave them on for extended period of time. Much safer than traditional lightings! Each star marquee lamp is 10 inches high with 11 LED lights. Has a socket on the back for wall mounting. Powered by 2x AA battery(NOT included), approximately 100 hours of battery life. Novelty Place is proud to have you as our customer. If your purchase is unsatisfactory in any way, you are covered with our FAST free replacement guarantee! Feel free to contact us! JUST ADORABLE - Inspired by old school marquee signs commomly seen in front of theaters, this star marquee lamp is extremely adorable. It undoublty catches the eyes of anyone who walks by! ALWAYS SAFE - These battery powered LED lights emit barely any heat during operation. You would never need to worry about fire hazard from your traditional decorative lights when you are absent. BEST DECORATION - Christmas, weddings or birthday, no matter what the occasion is, you will want these marquee lamps to brighten up the party! GUARANTEED - Novelty Place is proud to have you as our customer. If your purchase is unsatisfactory in any way, you are covered with our FAST free replacement guarantee! Feel free to contact us! If you have any questions about this product by Novelty Place, contact us by completing and submitting the form below. If you are looking for a specif part number, please include it with your message.